• Appearance - This dragonfly has bright emerald-green eyes and a metallic green body, with yellow stripes on its sides. Its body is about 2.5 inches long; its wingspan reaches about 3.3 inches. • Range - Historically, the Hine’s emerald dragonfly was found in Alabama,Indiana, and Ohio and probably has been extirpated in those states. Today the dragonfly can only be found in Illinois, Michigan, Missouri and Wisconsin. 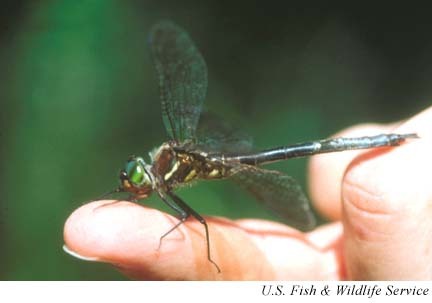 • Habitat - The Hine's emerald dragonfly lives in calcareous (high in calcium carbonate) spring-fed marshes and sedge meadows overlaying dolomite bedrock.